Last week, I was all but ready to write Gotham off. After numerous hours that failed to live up to expectations, it was hard to see any light at the end of the tunnel, any reason to continue on. This week was about coming back to earth, and coming to terms with the show’s strengths and weaknesses. Gotham is a far cry from a great drama, but it has decent building blocks that could one day get it to that echelon. What the show needs to do, at this point, is focus on storytelling. The most frustrating aspect of Gotham has been its inability to create interesting, affecting stories that can exist within both single episode as well as multiple episode arcs. Episode 14, “The Fearsome Dr. Crane” was a good step forward in that regard. The hour circled around a series of murders stemming from the same support group for people suffering from phobias. The first was of a man with a fear of heights, who was dropped from a high rise; the second (attempted) murder was of a man afraid of pigs found unconscious in a room full of the farm animal, and so on. The culprit of the episode was Dr. Gerald Crane (played impressively by Julian Sands), not the infamous Crane that Batman fans would know, but that character’s father. It was an interesting spin on what Gotham has been doing with many of DC’s more famous villains, that is, showing viewers young versions of the characters. Seeing Jonathan Crane’s father, and his equal interest (and equal insanity) regarding human fear was a nice twist on the usual prequel story. As has been the trend, thankfully, since the fall finale, last night’s episode was tightly told and focused. Thanks in part to Detective Bullock’s intimate interest in a concerned party of the investigation, “The Fearsome Dr. Crane,” did not meander much from the main investigation. Other important advances did occur, though, particularly with Lil Wayne and Penguin. After being told last week by Selina that she lied and did not see who murdered his parents (the truth in this remains to be seen), Bruce decided to remove Detective Gordon from the search for his parents’ killers. This intrigues me for a few reasons. One, will Gordon’s removal from the case (if he chooses to listen to an 11-year-old boy) mean a scaling back in the Wayne murders pervasiveness over the entire series? And two, will Bruce’s screentime, then, diminish? I would prefer to see the show move in that direction, though I know the network loves the hook of Gotham being a “Batman prequel.” As I’ve stated before, that’s clearly not what the show wants to be, and Bruce’s involvement has only complicated matters. Having him shift to the background, where he is, for the most part anyway, appearing every few episodes to keep us informed on what’s happening with the Wayne investigation, would be a smart move. The other huge advancement involved Penguin’s relationship to Sal Maroni. 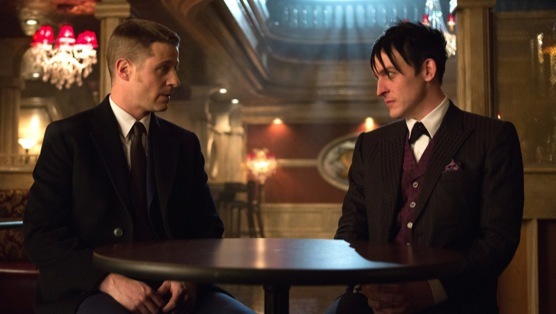 For weeks, we’ve known that Penguin is playing Gotham’s lesser mob boss, and this week Maroni finally caught up thanks to a timely call from Fish Mooney (who was seen briefly on a boat this episode, as well as in a truly confounding final scene). After finding out that Penguin was not telling the whole truth, but instead telling it slant, Maroni invites the aspiring fiend on a trip to the country. His intention, of course, is to kill Penguin, and he nearly gets away with it, but ultimately fails thanks to Cobblepot’s characteristic resourcefulness. The most interesting part about this is, now that Cobblepot is clearly playing for a single team, he can begin to focus on dismantling both Fish and Maroni more directly, and, hopefully, more quickly. It could also mean a potential teaming up of Maroni and Fish, as the two now find themselves with common enemies. While this hour didn’t build tension as well as some others have, its frenzied final act was more effective than many that have come before. For once, there was real threat that Harvey and Jim may not save the day, and the action-intensive moments in the climax did not feel bumbling, but instead well choreographed and genuinely exciting. Gotham still has much to learn from its CW counterparts as far as action is concerned, but that’s also not the linchpin of this show. First, and foremost, Gotham is a cop drama, where the investigation is king, and I’d much rather see Bruno Heller and his writing staff focus on creating compelling cases, than worry much about intense action sequences. Moving forward, I’m interested to see how the relationship between Gordon and Dr. Leslie Thompkins (Morena Baccarin) will progress, and if this means (please!) that Barbara finally has gotten the boot. Edward Nygma has never been a favorite of mine, and I still find his boyish awkwardness to be, well, awkward, so I’d much prefer that his sinister side be shown sooner rather than later. Luckily, this week was a move in that direction as Ed found a way out of suspension by framing the medical examiner (which also allowed Dr. Thompkins to become the new medical examiner). Reports have been that the second half of the season will see Ed move further and further to his ultimate villainous end, and I, for one, am much more interested in seeing how Cory Michael Smith will portray that aspect of the character. ?For the second time since the holiday hiatus, Gotham ventured on a multiple episode storyline to favorable returns. Next week brings part two of the Dr. Crane saga, and hopefully it will do much of what the Electrocutioner’s second episode did, without sputtering to a dissatisfying end like the latter. With all the parts Gotham has (which is a lot, this show is bursting at the seams), it can be hard to remember that it’s still working out the first season kinks, still figuring out how to put all those parts together. Things have been smoother in the second half, less needless plots being forced into episodes and more focus on creating villains and building characters, but there is still much to be done. With talks of Red Hood, the Graysons, and even the Joker coming in the final third of the season, we can only hope that a few of the seemingly innumerable pieces Gotham has to play with are put in their place, or else this show could burst, and find itself irreparable.